Introducing the new head of the organisation’s Dongguan-based operation and outlining plans for future growth in the region. SATRA has a new China office general manager following Liam Donnelly’s recent retirement. Anthony Mak brings experience and an in-depth knowledge of project management, footwear manufacturing, sourcing and quality assurance to his new role, and will be responsible for developing SATRA’s operation in China and the rest of Asia. Following his studies at the University of Toronto, Anthony earned an MBA from the UK’s University of Manchester. 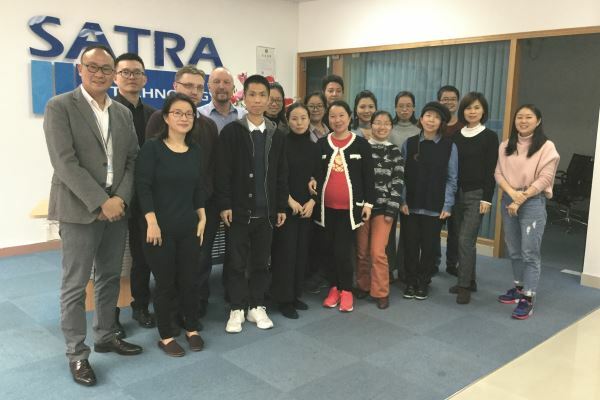 SATRA’s technical team is now being expanded to manage the growing demand for the organisation’s quality services and laboratory procedures in China. Three new roles have been created – quality services supervisor, laboratory technician and calibrator. Further expansion of SATRA’s China laboratory is planned in order to fulfil more footwear and glove testing and to increase testing to Chinese GB standards. This expansion will include a renovation of the China office and will provide additional floor space to cater for new equipment and personnel. During 2019, effort will be made to further improve engagement with SATRA members and promote product efficiency systems to manufacturers and brand owners in the region. According to Anthony Mak, the future will be a very exciting time for SATRA’s China office, as continuous growth is expected to be seen on product certification, quality services and testing work. The photograph above shows new SATRA China office general manager Anthony Mak (on left) and retiring head Liam Donnelly (fifth from left) with the Dongguan-based team. Please email info@satrafe.com to contact SATRA’s China office and to discuss the testing services available to companies in the region. This article was originally published on page 19 of the April 2019 issue of SATRA Bulletin.